People often remark that I look as though I couldn’t possibly have graduated from high school. Or they ask if anyone has ever told me that I look like a young Mark Zuckerberg. Either way, I can handle being told that I look young or like a genius billionaire. In fact, I appreciate it. Though the mirror shows me some dark circles forming under my eyes. And something within me tells me that my soul is growing older. I’m becoming something of an old dog. And it is another old dog who is inspiring me to learn some new tricks. The fellow you see in the photo here is my buddy Hunter. He’s a Golden Retriever, shorn to endure the heat of the Sacramento summer in this picture. He’s an old dog. Hunter is our first and largest child, clocking in at 10 years of age and weighing in at 80 pounds. At no time has he ever hunted and would surely have had a heart attack if he ventured anywhere near the blast of a shotgun. You oughta see his frenzied response to a sound of a popped balloon. Timid though he may be, he’s outlasted a temperamental cat and six fish. More impressive still? He’s survived the onslaught of our three human children. I suspect that it is those very kids cajoling/pulling/riding/poking him that has turned the once-red hair around his eyes a regal white. Perhaps Hunter’s most amazing trick is something other than the sitting, heeling, laying, or paw shaking. You see, even as my kids grow and take over each of Hunter’s sacred spaces, he moves to another spot and adapts. He accepts that his home is changing and trusts that we’ll still keep his place in our family. His spaces are no longer his own and he finds a way to deal with that. Sometimes that means this old dog rolls around in the grass with the kids he loves, and sometimes it means he vanishes into whatever corner of the house has soft carpet and is furthest from the din. The elder statesman of our house has got change figured out. 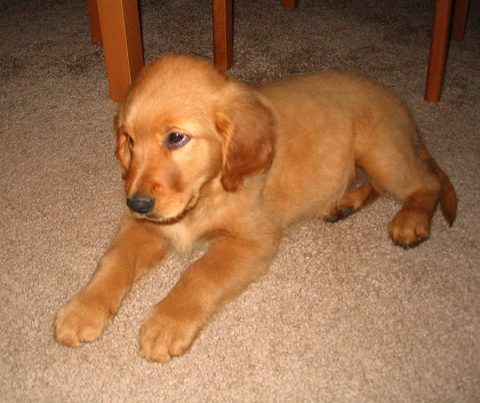 Bonus photo from 2007: Hunter had those sad eyes as a pup. I’m not quite as old as Hunter (after accounting for dog years) though I’m halfway into my thirties. This is a time of pouring into my kids, mining new treasures from a second decade of marriage, and settling into my career. Only, I’ve just launched into a new career. Yipes. If you’re reading this blog, you probably know me well enough to realize that photography is becoming a greater source of joy in my life. The learning curve. The creative outlet. Getting outdoors. Meeting new people. I find that each of these things fills my sails, and has done so for several years now without the threat of the “honeymoon” ending. As my passion for photography has grown, my heart, my wife, and my God have given me the push to make photography the largest part of my work life. And so I did it. The flux is all so exciting…and equally challenging. The changes make me feel as though I’m taking uncertain steps across sand dunes, slipping and sliding downhill as much as I’m making climbing upward. The professional world I knew so well before is no longer my stronghold. So many of the professional skills and coping mechanisms I’d developed before just don’t apply any longer. And as a relative newcomer to photography, I often doubt whether I can keep up with the cool kids who’ve been at it for years. Have I said “yipes” already? I suppose that this season of transition is why I find myself leaning upon God with greater abandon. My faith in God is already the sort of relationship that demands trust in someone unseen, to lead me for a lifetime no less. Honestly, that sort of trust feels almost effortless and passive when I’m humming along the familiar streets of life. But now that I’m walking down streets whose names I don’t recognize, this trust is becoming more active and constant. As I reshape my identity along with my work, I’m suddenly feeling weaker personally but more acutely aware of God’s strength to provide. Though I’m an old dog myself, it seems God is making me into someone new—that’s His business after all. And all that is far more invigorating than it is scary. That’s likely just what I needed. In other words, my shift into a photography career means that my former sacred spaces are no longer my own. And along with all my photography tutorials and gracious brainstorming sessions with my wife, I’m turning to the sacred for help in learning some new tricks. 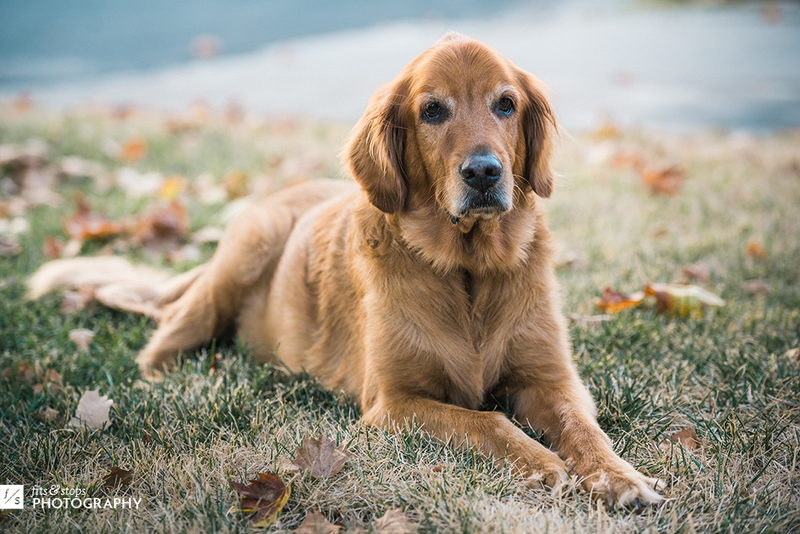 I figure that if my ten-year-old golden retriever can deal with all the changes that come with life, perhaps I can too. What new tricks have you had to learn in the process of navigating life’s transitions? Share a bit in the comments below! It seems like every few years is a shift in life’s navigation for me. The longest Penelope and I have stayed in one place is about 11-12 years. Most of our stints have been more like a few years. I’m a wanderlust. So while I’ve enjoyed all the different moves, as I get older and the home renos get tougher, the jobs are just another job, it’s an ongoing process to learn contentment. It’s not one of my strong suits. I just keep trying to lean more into Jesus and less on me. Sounds like you’ve dealt with more and more significant transitions than most. That contentment lesson is one I’ll need to learn too! My mantra in life is never stop learning. Change is just a chance to learn a new way of doing things. I am so excited that you have taken the plunge into something you love and are truly lead to. Enjoy the creative moments they are what make not only your life, but other’s lives special! Good call, Shelle. I think that being in a state of learning keeps us humble, eh?